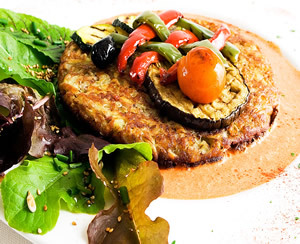 The Vegetarian Restaurant at La Maison du Vert is here to serve you delicious gourmet vegetarian and Vegan menus with plenty of choice. Over the past 9 years our restaurant has gained an excellent reputation with locals and tourists visiting from all over the world. Our cuisine reflects this, offering flavour sensations from all corners of the globe, perfectly combined in our completely vegetarian kitchen. Your evening starts with tasty olives served with your pre-dinner drinks. You may find it difficult to decide between our delicious home made liqueurs, cocktails and french aperitifs! You can enjoy your tipple outside in our beautiful relaxing gardens or in our comfortable guest lounge. This is followed by your choice of dishes from our current menu (see example below). We always serve our popular homemade organic bread with garden herb flavoured butters to accompany your meal. 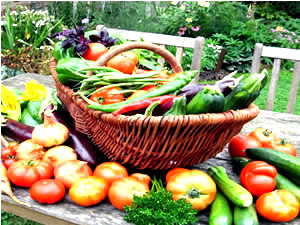 All our dishes are home made with the freshest produce available, the majority being our own home grown organic vegetables, fruit and herbs. We believe that the best eating experience is created out of vegetarian, organic, environmentally friendly food. Our menu has plenty of choice for vegans and most dishes can be adapted to be vegan. We also happily cater for special diets such as Gluten free. We don't have a children's menu as they vary so much with their tastes so we just cook them what they like to eat! Some will happily eat from the menu whilst others prefer plainer foods such as pasta or jacket potatoes. Just let us know when you book if you have any special requirements. All of our eggs are from our free-range, well-loved chickens who live with freedom at the bottom of the garden until they die a natural death and go to chicken heaven. Do you know that chickens can live 8 - 10 years or more? We have some lovely old girls and cockerels. 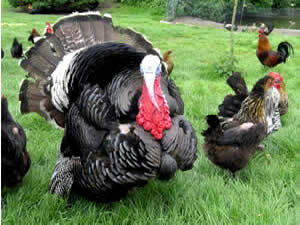 We also have turkeys, one of our handsome chaps loves posing for the camera! 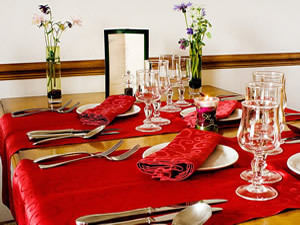 The restaurant is sophisticatedly decorated, with cream drapes framing the lovely views of our garden and the village from the window. There are always fresh flowers from our garden on every table. A mix of both French and English ambient music emphasizes this relaxing atmosphere. You can choose to eat on our garden terrace if you prefer, enjoying our beautiful gardens and the lush Normandy countryside. From our mouth-watering menu to our organic wines, carefully chosen to complement vegetarian food, much care and attention to detail is taken. 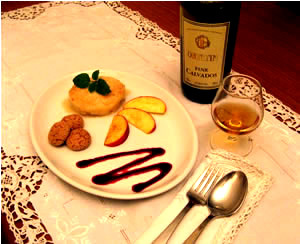 Presentation and nutritional quality is just as important to us as the delectable taste. We offer many different liqueurs and spirits (the famous local calvados being one important one!) cocktails and coffees, as well as a wide range of herbal and fruit teas, non-alcoholic cordials (some home made), juices, local organic apple or pear cider and bottled waters. Tasty crisp little sweetcorn fritters, served with a sweet chilli sauce, satay dip and sesame oil dressed courgette and carrot ‘noodles’. A smooth creamy soup made from fresh peas and garden courgettes blended with a touch of mint. Deliciously smooth lightly spiced red curry style soup with delicate flavours of lemon grass, ginger, tamarind and kaffir lime leaves, topped with stir-fried oriental vegetables. Warm pastry parcels filled with melted blue cheese, served with a redcurrant & cranberry sauce and garden fresh herby salad. 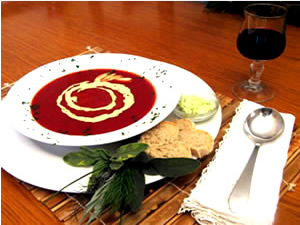 Rich and smooth soup made with slow oven roasted red peppers & fresh tomatoes flavoured with smoked paprika & finished with a swirl of basil infused olive oil. Seasonal vegetables coated in a herby Italian batter, served with creamy sundried tomato sauce and salsa. 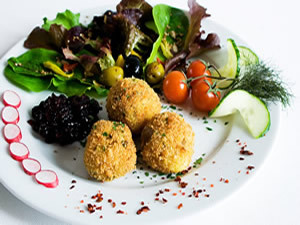 Greek sheep’s cheese baked with sweet pepper, onion, herbs and olive oil served with fresh salad leaves and herbs. A delicious selection of Italian appetizers, including sundried tomatoes, marinated aubergines, courgettes, artichokes & mushrooms, olive tapenade, with freshly baked ciabatta. A mezze of falafel, hummus, stuffed vine leaves, herby couscous, tzatiki, tomato, onion, parsley salad and warm pita bread. 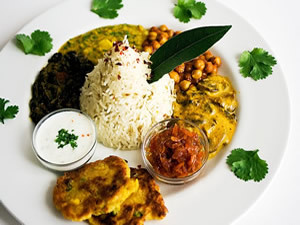 A flavourful selection of Indian curries, dahl, basmati rice, spiced carrot and ginger chutney, mint yoghurt sauce and fresh Indian potato bread. Crisp fried cake of mushrooms and chestnuts on garlic butter spinach with a horseradish and parsley cream sauce served with dauphinoise potatoes and seasonal vegetables. Rösti topped with melted goats cheese and sundried tomatoes surrounded by a cr2amy roasted red pepper sauce. 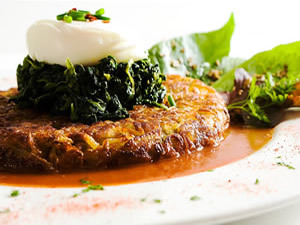 Rösti topped with garlic butter spinach and one of our free range poached eggs surrounded by a tomato and cumin coulis. Rösti topped with mixed pan-fried garlicky mushrooms, and surrounded by a deep green fresh garden herb sauce. A pizza-style rösti topped with peppers, mushrooms, olives, capers and melted cheese surrounded by a herby Italian tomato sauce. Leaves and raw salad vegetables, with a balsamic dressing and tamari soaked seeds. A citrusy delight! Lemon sponge topped with a dollop of silky smooth zesty lemon curd surrounded by raspberry coulis. Plum, gooseberry and red fruit compote topped with a crunchy oaty crumble topping, served with creamy vanilla custard. Apples Pan fried in a Calvados and Caramel sauce Served with Crème Frâiche and Cinnamon. Red gooseberries from our garden made into ice cream make for a tangy yet sweet taste sensation! Deliciously smooth Ice Cream using Currants from our own garden with a touch of Crème du Cassis. Rich Creamy Coconut Ice Cream with little bits of Crystallised Ginger. A Rich Creamy Caffeine-Spiked Ice Cream, served with a Swirl of Smooth Coffee Syrup. Velvety Ice Cream made from quality French Chocolate served with Cream and Chocolate Shavings. A refreshing slice of Cool Sorbet, made from Charentaise Melons and a dash of Pineau de Charentes. Refreshing Sorbet made with our own garden Plums, 5 Spices and a touch of Muscat Wine. 3 delicious cheeses served with salad leaves and walnuts.